Online: Urban Omnibus produces discourse on architecture, new and old, in New York City; perhaps the most-influential built environment on earth. 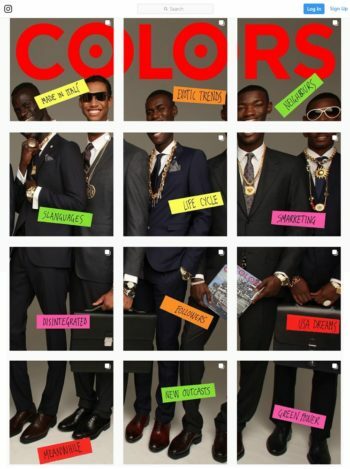 Previously thought to be defunct, legendary COLORS magazine seems to be having a rather covert rebirth. As detailed previously, COLORS was a prolific and subversive quarterly magazine, based in Italy and originally founded in 1991. 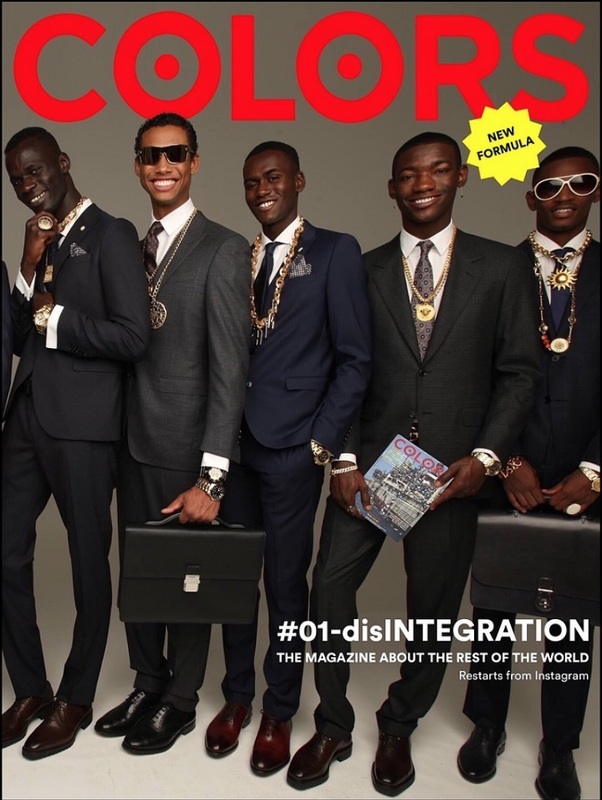 As implied by its strapline, “a magazine about the rest of the world”, every issue was supported by a theme that dictated the flow of reportage from an international perspective, as opposed to the dominant occidental, Eurocentric and/or American point(s) of view. Although there doesn’t seem to be much information out there about this reboot, all of the above still seems to apply. There is only a semblance of a cover to be found online, with the iconic COLORS masthead, and the little yellow star stating “new formula”. It appears that Instagram is the first touchpoint for this perceived relaunch campaign. Themed “disintegration”, issue #1 seems to be solely available on Instagram at present, with the cover puzzled together 12 twelve separate posts. Each post has its own visual and literary content, titled accordingly with haphazard post-it-like titles, which collectively seem to comprise the entire issue or, at best, acts as a taste of what is to come. 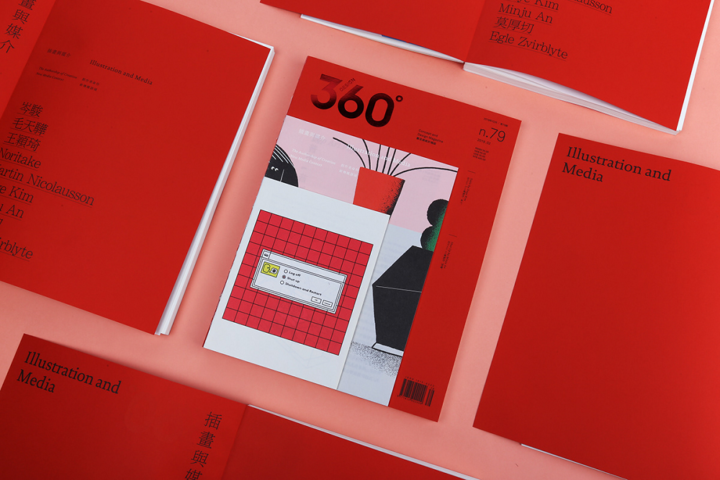 Design 360° is a magazine about all kinds of design: graphic design, industrial design, fashion design, illustration, etc. Focused on concept as the precursor to craft, Design 360° introduces international trends to an Asian audience, and grants its international audience access to designers and design institutes from across Asia. In essence, Design 360° is a bridge between the predominantly Chinese design community who forms the backbone of the magazine’s readership, and the broader design community across the globe. Interestingly, the magazine uses three different formats, acting as variable section dividers with slightly differing contents and approaches, while maintaining synergy as one publication. Issue #79 is themed “Illustration and Media”, and emphasises the role that illustration has as a vital branch within the overall rubric of visual communication, particularly when it comes to the happy marriage of concept and craft, and the narrative power of illustration as a discipline. 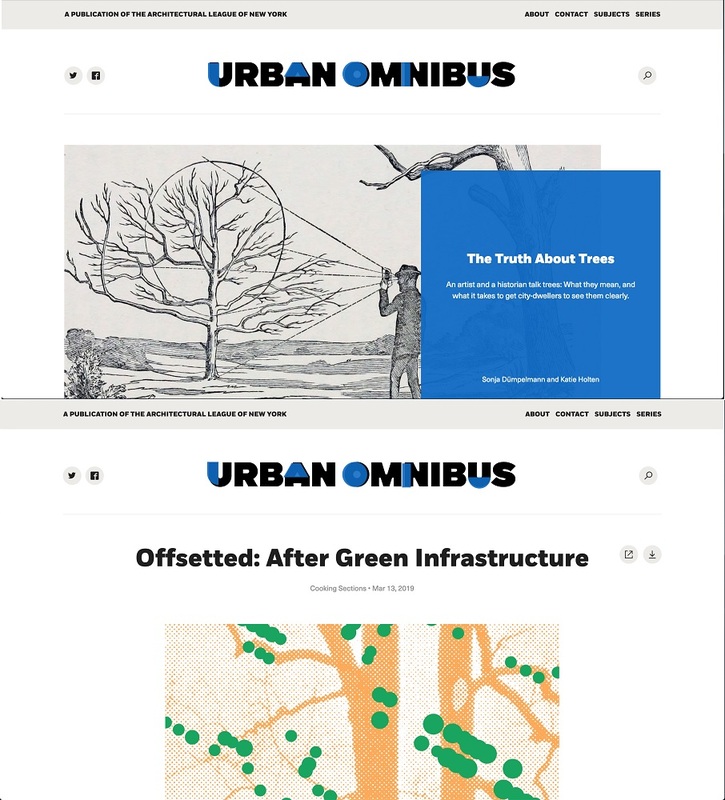 First released in 2009, the New York-based magazine, Urban Omnibus (UO), is an online publication made possible by the Architectural League of New York. Dedicated to observing and comprehending the multifaceted architectural dimensions of New York City, one of the most-impressive built environments on earth, UO investigates and documents creative output that actively produces culture, advancing the collective efforts needed to keep building this ever-evolving metropolis. The site is easy to interact with, thanks to its uncluttered, user-friendly navigation, supported by its accessible and pleasant aesthetic, and approachable content. At the juncture where design and technology meet, UO is developed by fellow New Yorkers, Athletics, which is a cross-disciplinary creative agency also geared towards the cultivation of culture. Likeminded, collaborative, creative communities and cultural entities such as these keep the world ticking, the more the merrier. Deriving its name from the San word, “!Cagn”, referring to the mantis god of the !kung, a high-ranking spiritual being in San culture — a deceitful, shapeshifting deity who could assume many forms, from a snake to an ordinary San — Kagenna was an alternative, underground, counterculture magazine published during the transitional years just before independence and the birth of democracy in SA. Its title also refers to the Jewish word for hell, “Gehenna”, suggesting the provocative, somewhat-mischievous, nature of the publication. 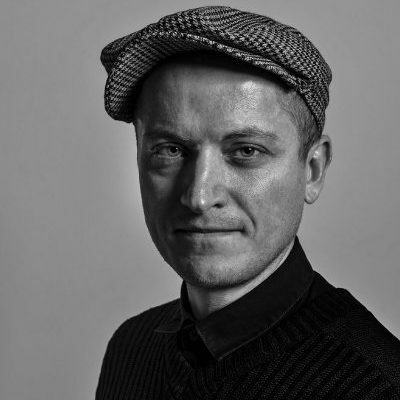 Riffing off the energy of liberation brewing at the time, Kagenna was a collective creative inquiry based in Cape Town, inspired by the fall of the Berlin Wall in 1989 and focused on ecology, art and technology. On surface reading hyperbolic, Kagenna was an analogy for a belief that stood at the heart of the San people’s religion, describing the spiritual connectivity between human beings and animals — an archetype for the essential link between body and soul, consciousness and the universe. 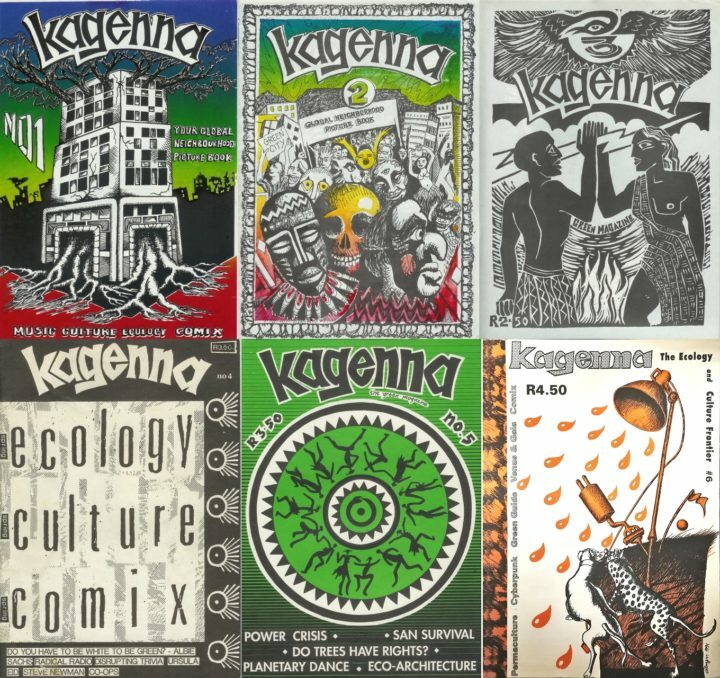 Kagenna contained reportage by activists and anarchists alike, subversive to the tee, considering that it was technically published during the apartheid era. With a print run of 2000 copies per issue, the early editions had bespoke printed covers and experimented with different printing techniques. The cover for issue #1 was a mix of silk-screened and Xeroxed components, hand-crafted. Consecutive editions evolved, and became more sophisticated, eventually developing into a successful press. Kagenna’s strapline, “The Ecology and Culture Frontier”, broadly associated the publication with the then growing “technogaian” movement (loosely related to transhumanism) and tied it to older counterculture roots, notably quasi-hippiedom or borderline bohemia, rather than true avant-garde tendencies. The magazine only produced six issues but each was filled with edgy material that pushed the envelope, arguably being a tad subjective, idealistic, and overtly romanticist at times. Issue #2 also had a silkscreened cover; #3 followed the theme “Plastic Propaganda” (perhaps more relevant today) and contained a poster made by Beezy Bailey; #4 contained an article titled, “Do You Have to be White to be Green?”, by Albie Sachs; #5 emphasised the survival of the San people and eco-architecture; and #6 was accompanied by a text titled “Cyberpunk” by Timothy Leary (the infamous American psychologist notorious for his support of the therapeutic potential of psychedelic drugs). The final issue, designated #7, seems to be a 10-year anniversary re-issue which was published digitally in 1993, likely the first of its kind in SA. The influence of rave culture is clearly evident in this last issue, particularly with the choice of design aesthetic, which looks like a warehouse party invite, and the change in tone of voice suggested by the introduction of another strapline: “Intergalactic Culture and Funky Ecology”.